This reading response rubric aligns with my Stop and Plan Checklist to provide a way to give students specific feedback on their paragraph structure when writing responses to reading. 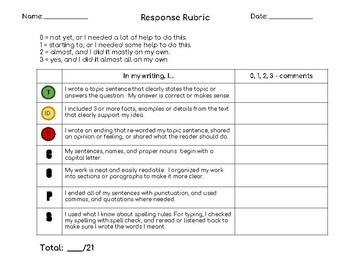 My students are highly motivated by improving scores, so the rubric provides an overall number score, which gives students immediate feedback as well as an easy way for teachers to collect and analyze data to monitor progress. Check out the matching Stop and Plan Checklist for student use!